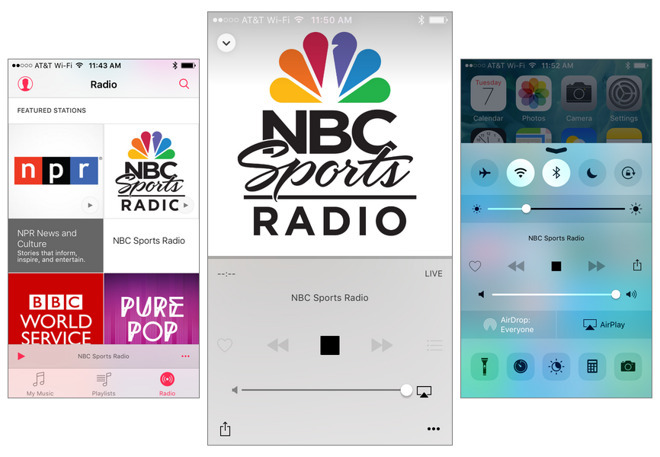 NBC Sports Radio is now available to stream via the iOS Music app, or in iTunes on a Mac or PC. It joins other live news and talk stations available from Apple such as NPR and BBC World Service. The 24/7 NBC Sports Radio station is home to sports talk personalities including Mike Florio, Chris Mannix, Rodney Harrison, and Amani Toomer. iTunes Radio launched in 2013 as a free service for iOS 7, Mac, Apple TV, and Windows PC, like similar offerings from Pandora, Apple's ad-supported free-to-stream product offered listeners pre-programed music playlists with limited song skips. iTunes Radio was rolled under the Apple Music umbrella earlier this year. More recently, Pandora-like music stations have become exclusive to Apple Music subscribers for $9.99 per month. But news stations, including NBC Sports Radio, are available to stream for all users, without any subscription. Apple is expected to announce multiple enhancements to the Apple Music service, including potential new Beats radio stations, at next week's Worldwide Developers Conference. The company will host a keynote presentation next Monday at 10 a.m. Pacific, 1 p.m. Eastern, and AppleInsider will be there live.